Original caption: This image shows the APEX view in sub-millimetre light of the region around the Spiderweb Galaxy— a protocluster of galaxies in the early Universe surrounding a radio galaxy containing a supermassive black hole. Some of the blobs in this image correspond to dusty star-forming galaxies in the protocluster that cannot be seen in visible light due to absorption by dust. The fainter features here are artifacts of the difficult APEX image processing. ESO (European Southern Observatory) has announced the discovery of a “huge” star-forming region obscured by dust in the Spiderweb Galaxy protocluster. Alternatively, it may be a tiny spatter of dusty plasma ejected from a nearby galaxy. The Spiderweb Galaxy is a radio galaxy with a redshift of 2.16 in the middle of a string of 16 faint blobs, called submillimeter galaxies (SMGs), with redshifts around 2.2. 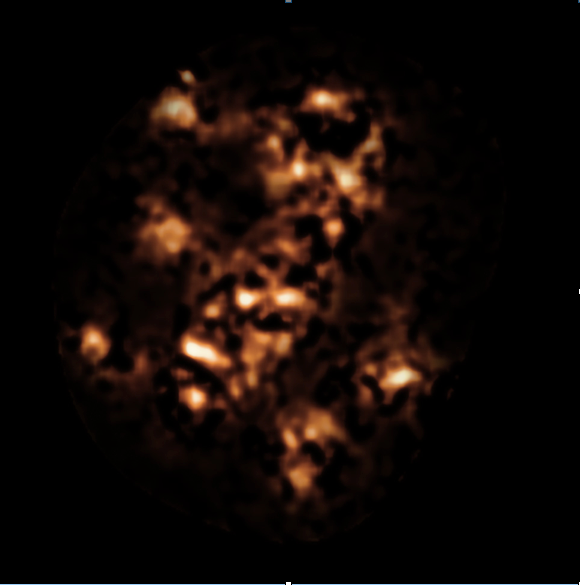 The SMGs are thought to be in the process of forming stars on their way to becoming member galaxies of the protocluster. The unquestioned assumptions are that redshift is a Doppler effect of the expansion of the universe and that expansion velocity indicates distance. This requires the strings and blobs to be far away, and therefore they are “huge” and extremely luminous. Halton Arp, in Seeing Red, chapter 6, details the evidence that so-called galactic clusters appear as “faint little fuzzy spots” because they actually are low-luminosity, small, and wispy. “Everyone—myself included—thinks instinctively of galaxy clusters as galaxies like our own seen at great distances.” [p. 143] But doubts arose: Many high-redshift clusters were aligned across low-redshift galaxies—along with quasars and x-ray objects. They were connected with the low-redshift galaxies by x-ray and radio bridges. They did not show the expected Hubble relation with magnitude: the magnitude range was around 4 magnitudes instead of the expected range of a few tenths of a magnitude. He followed the evidence to the conclusion that his instinct was in error and that the clusters actually were small and faint wisps of ejection from the large and nearby active galaxies. Thunderblog Oct 20, 2014 — Wird NASA die Geschichte umschreiben?